Calving season is almost upon us. 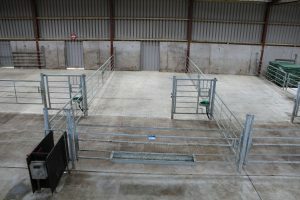 A well laid out calf house and safe calving facilities are key to easing the pressures of calving season. This is one of the most dangerous times of the year in terms of handling animals on farm. A calving gate can save time and energy along with a safer working environment. If there is one item, you add to your calving setup this year we would recommend a calving stall or a 3 in 1 calving gate. This could be a lifesaving decision. 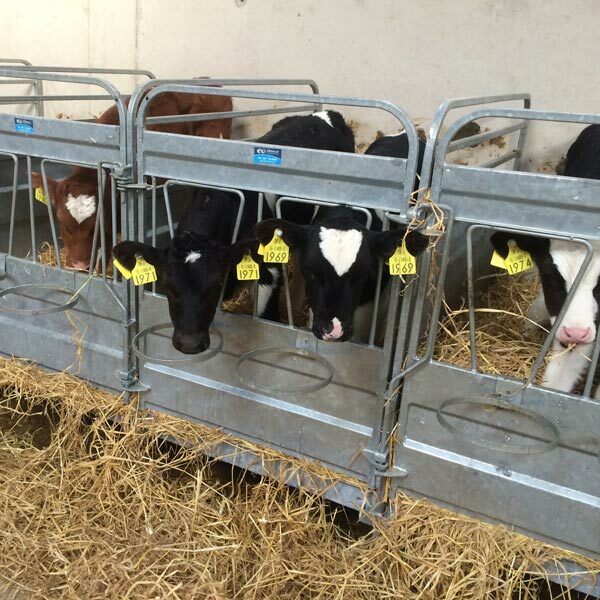 A decision many farmers face during any calving period is the ratio of Group Calving Layouts to Individual Calf Pens. Both are great, both are necessary, and, like anything, both have their advantages and disadvantages. These are very good for early calf development of a new-born calf are not competing for milk. 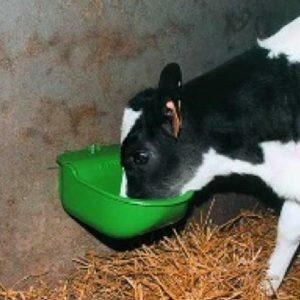 Therefore, you can clearly see if the calf is drinking as much as it should be. 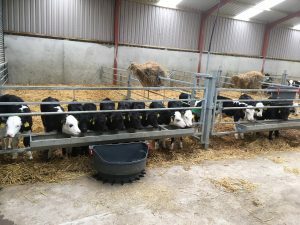 These pens take the strain out of training new calves to drink. Anybody who’s fed calves knows the hardship of trying to train a new calf to drink whilst getting swarmed by a bunch of hungry calves! However, despite these positives, there is a negative aspect of feeding being very time to consuming compared to group penning. Feeding time is greatly reduced as you are feeding many calves at a time. Usually 10 depending on the size of the pen. 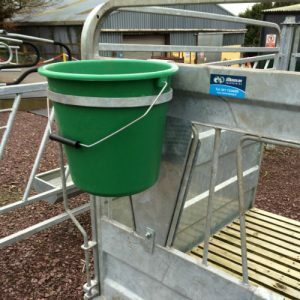 A must for when calves get to the stage of being fed hay and meal. 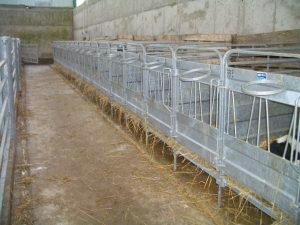 Gates come in horizontal or diagonal bar feed gates to suit customer preference. There are several different layouts that we would recommend for different situations or needs, from automatic feeding systems to a simple group pen. This all depends on you. 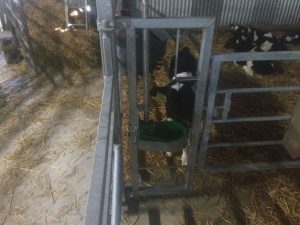 Having a hinged front gate provides easy access to the calf. This is beneficial as you will be up close and personal with calves in their first couple of days in order to monitor them and feed them. These pens are quick to assemble and dismantle for easy storage. the plastic slat is easy to clean and very hygienic. the plastic slat will not hold bacteria as a timber slat would. 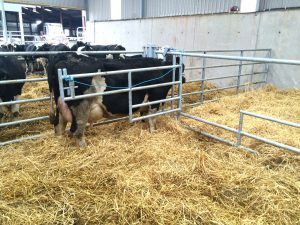 Plastic slats are an ideal solution for lie back area reducing labour and cost of bedding. 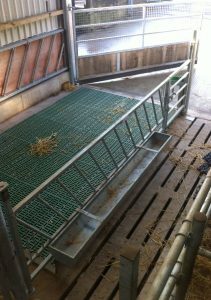 We recommend these above the treated timber slats as they are very comfortable for the calves and far more hygienic. 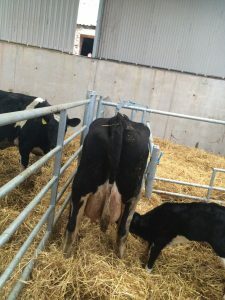 As regards space, each calf will need 1.5m2 for the first 19 weeks. 1.7m2 19-32 weeks. 1.8m2 from week 32 on. 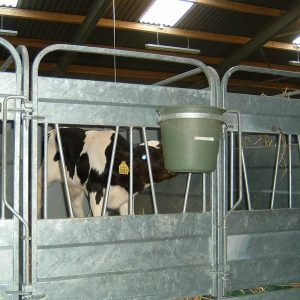 Calf penning gates are height adjustable and have stock proof latching. 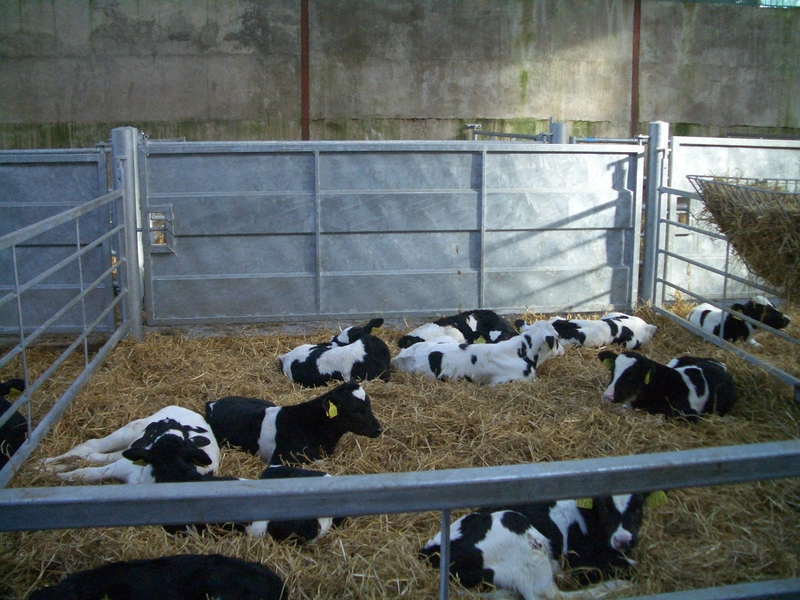 Individual calf pens can reduce the spread of diseases as calves are separated. This is beneficial for the animal as there is an increased risk of contracting a disease in the calves early days. 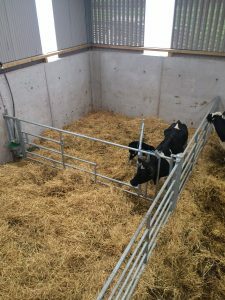 Individual calf pens have the option of a plastic slat or a treated timber slat. 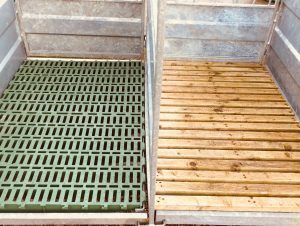 We recommend the plastic slat as they are more comfortable for the calf, more hygienic and are easier to clean. As the calves get older they are at less risk of contracting a disease and spreading it amongst the herd. So having them together in group pens is both safe and efficient. The physical design of the shed should also be considered to ensure a well-ventilated building, with minimal draughts. However, good ventilation is also important, as this prevents the build-up of air-borne diseases, reduces the moisture in the air and prevents both irritant gases and smell. Teat feeders and the clip on bucket rings for feeding the calves milk should be utilized here to supply water to the animal on an ad lib basis. Water should be available on an ad-lib basis. Water should be available to the animals in a bowl with a reservoir as they will be enticed to drink. All in all the best calf rearing system would incorporate both of these options. 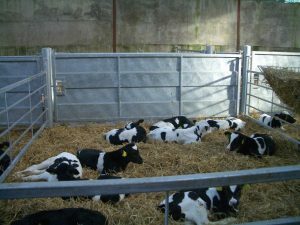 Individual calf pens are undeniably ideal for newborn calves and training. However, as calves progress, group penning makes it easier to manage larger numbers of bigger calves.